Just for yucks I thought I’d share one of my recent star-hops. I use several different scopes for star-hopping, but they all share a common feature; a good 50mm RACI finder (Orion or Antares). I find that this gives a field of view that is large enough (about 5 degrees) to show a nice section of sky and narrow enough to accurately point the scope. It also has enough light grasp that it makes a good match for the S&T Pocket Star Atlas. My star-hopping gear varies from a number of different scopes on a Twilight I altaz mount, to my orange-tube C5/8, pre-GoTo Meade 8” and 10” SCTs, and my Lightbridge 16. All but the Lightbridge offer nice slow motion controls while the Lightbridge is a fairly standard Dob. It’s hard to pick a favorite, but I probably get my orange tube C8 out more than any other scope. Last night I wanted to test my 10” Meade of LX6 vintage on a standard field tripod to see how it worked while seated. (Very nice.) The scope was operated at its native f/10 with a 2” visual back and diagonal and a 24mm UWA (82 degree) eyepiece giving a FOV of about 0.8 degrees. For me, star-hops come in two flavors; short hops to locate a specific target, or long hops to see what there is to see. I’ll usually spend most of an evening on one or two long hops of an hour or so each, and then end the night revisiting some old friends. I record each of these on a copy of S&T’s Pocket Star Atlas. This is one from last night that started at Vega and the double-double, worked its way down Lyra to M57, then over to M56, and on to Albireo. This chart picks it up from there as it flows across Vulpecula, Sagitta, and ends in Delphinus. All of this is done with the finder with stops at every star and object along the way to take a peek through the main scope, and to maybe linger a while if the view is neat. The wire loop is a little tool that I made that approximates the field of view of my finder. It also makes a dandy paperclip/bookmark. Feel free to share your own favorite star-hops. Heads up! I'm going to appropriate the the wire tool/paperclip, bookmark idea. Heh, heh, that's okay, I got the idea from someone else, I just can't remember who. Ugh. Memory is the second thing to go... I can't seem to recall the first. Its an amazing idea! Using other items to make tools is where this hobby really can be awesome! I put my little FOV circles on clear acetate... 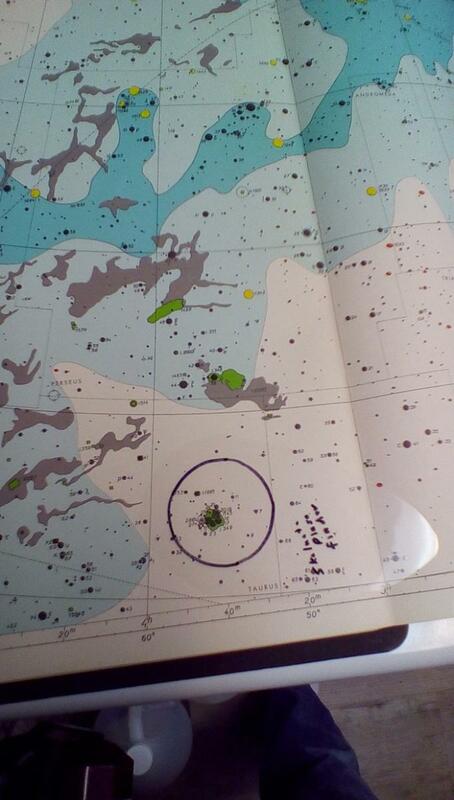 The pics show my circles on the old Skalnate Pleso atlas, and the Uranometria 2000. The Uranometria has a large enough scale that I have a circle for my low power eyepiece, and I'd be LOST without it. Perhaps S & T's Alan MacRobert? One of the easiest and most enjoyable star-hops, in my opinion, is from Delta Corvi (Algorab) to M104. Approximately 2.5 degrees to the northeast of Delta Corvi is a triangle of fifth and sixth-magnitude stars that points to the Stargate asterism. The Stargate is also triangular in shape and, in turn, points to an asterism known as Jaws. Jaws lies 25 arc minutes west-northwest of M104. The brighter stars in Jaws point directly at the Sombrero Galaxy. "Perhaps S & T's Alan MacRobert?" That's it! Thanks! His is purdier than mine. "One of the easiest and most enjoyable star-hops, in my opinion, is from Delta Corvi (Algorab) to M104." Very nice! I am certainly open for suggestions for star-hops that take you through some nice star fields. I found that marking up a Pocket Star Atlas is a great way to record these off-road romps. "I put my little FOV circles on clear acetate..."
Great idea! I can see these working as bookmarks as well. Another technique is to use planetarium software set for your site and date, and pick a declination (+/- one half of the TFOV of your finder eyepiece) that is particularly rich in objects for the night, and simply determine the times during the night each target will drift through your FOV. My best hop is from M4 in Scorpius to M6 to M7 then M69 or M70 and up through Sagittarius to M22 to M28 (sometimes M28 to M8) then M20. Bumm and jgraham, great ideas. John, your Lyra to Delphinus route is my Summer Trail. I'm pretty sure I read about it years ago in either S&T or AM, but in the course of time... I forget. This is a map of last night’s star-hop in eastern Cassiopeia with my orange-tube C8. 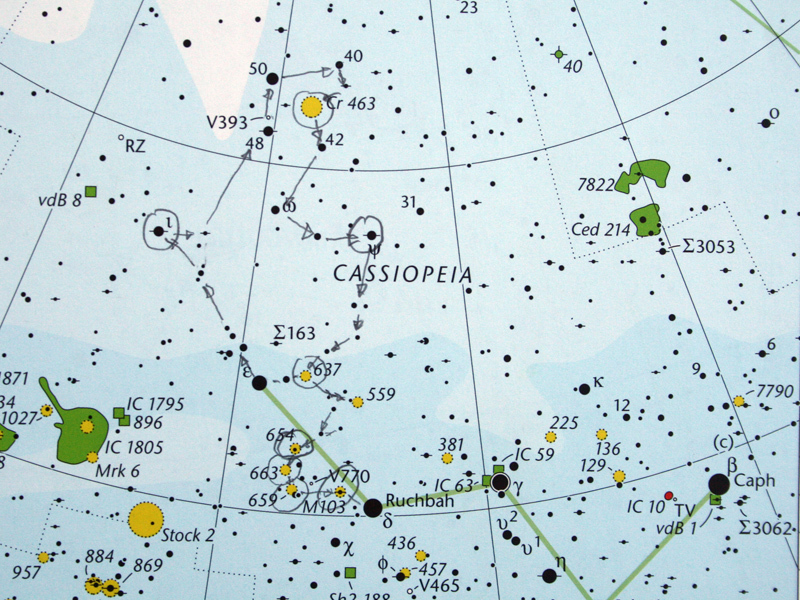 Starting at epsilon Cassiopeia, sweeping northward to 40 Cassiopeia, then back southwards to delta. The open clusters in this region are wonderful. M103 is the brightest; the others are delicate patches of stardust. Like many deepsky objects, its fun to spend some time soaking up the field and watching them slowly appear. With the moon brightening in the southern sky I’ll be exploring the central region of Cassiopeia this evening with my 10” LX6. something worth noting about john's practice is the ergonomics: he's seated, has the eyepiece at a comfortable height, a table nearby for notes, and a visually friendly fork mount. the fork mount is especially cool because north is always in the same direction in the field of view, provided it's polar aligned and the diagonal isn't rotated. this makes "knowing where you're going" in relation to the atlas landmarks straightforward. i bring up the physical comfort issue because star hopping is a natural complement to "sky wandering" (especially in the summer milky way) and prolonged observation of "discoveries" and other novelties. I bought a clear plastic degree grid,(the same type clear plastic that the Uranometria atlases provides) at a star party swap meet years ago. Only this one is like a big 8"x 11" target showing concentric circles from the center from 1/4 of a degree and going out to 16 degrees. A club member designed this for use with Uranometria....But I am so used to using Uranometria that I don't feel I really need some ring devise or clear grid like this one when I star hop-- although I still keep this clear grid with my charts and occasionally use it to check or verify something. So I don't follow some regimented step system of moving a ring in progressive increments on my charts to reach my target object. I can just look at the charts and tell or estimate how far I need to move the scope according to how my Uranometria charts match the star patterns I see in my 8 x50 finder, (which shows about 5 deg's). The main thing is to recognize star patterns and make sure you are going the right direction to reach your object. It's also much easier and quicker if there are brighter and easier to recognize star patterns when helps you get to your object and can just get there sometimes in one step even if it's 5 or 10 deg's away from your starting point. The real challenge is once you know you have reached your target getting some real faint DSO to show in your scope, which isn't always easy. Edited by Philler, 25 September 2015 - 12:42 AM. I'm looking forward to some destination hops now that the Milky Way is swinging westward and the sparser skies of fall are rising, but for now I'll be concentrating on these sky-walk hops. What's neat about recording them in my Pocket Sky Atlas is that I can walk the same path with a large or small scope later just to see what there is to see. Kinda reminds me of my J.U. 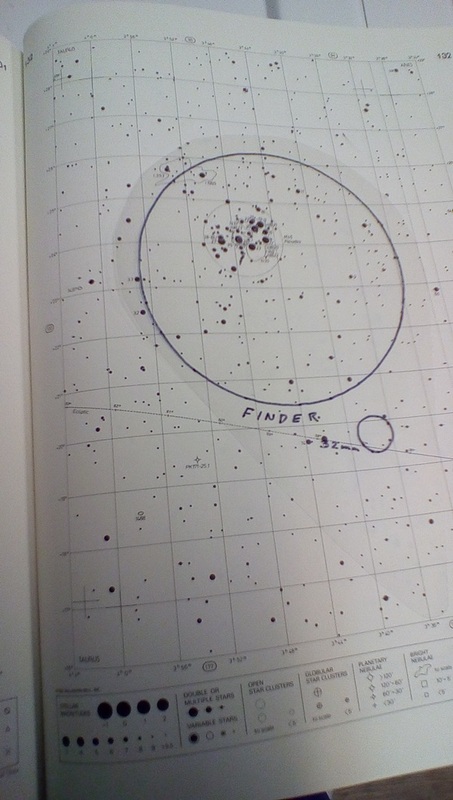 Gunter asteroid days back in the 70's when you would get very familiar with little patches of sky as you located those tiny worlds night after night as they crawled across the sky. After a while you got really good at spotting the star that moved! I'm coming to this thread late, but this had been unexpectedly eye-opening. I have always enjoyed star-hopping, but it has never occurred to me to do it the way John shows. I suppose much of this was that I got involved in the AL awards very early on, so there was much emphasis on checking the objects off on a list and the point of an observing session was to log as many as possible through the most efficient star hopping possible. 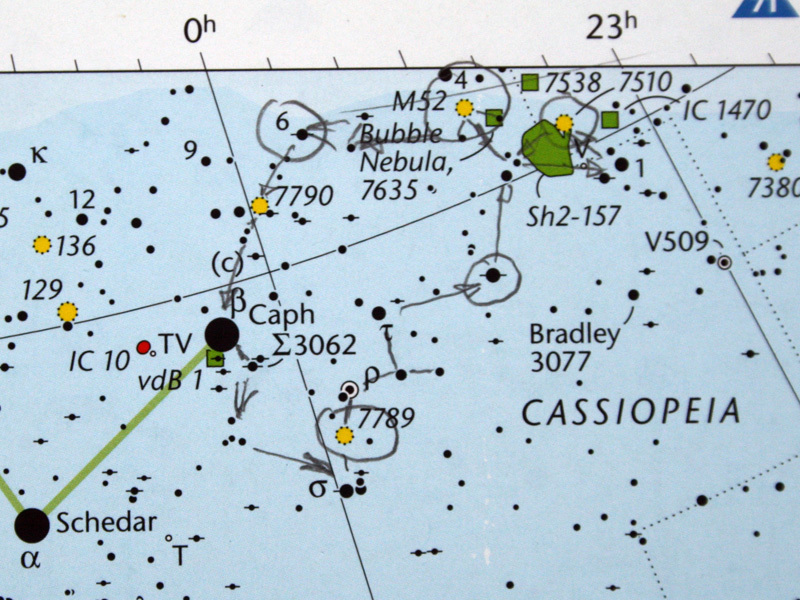 For example, on John's Cassiopeia chart, I would have started at Delta, "bagged" M103 and its western neighbors, then jumped to Epsilon and picked up the two nearest it, then back to Epsilon and straight to Cr 463. I like the approach detailed in this thread. It's a more leisurely approach, a more relaxed approach, and certainly an approach that lends itself to a greater familiarity and kinship with the night sky, which has become more and more my focus as of late. I suppose if I were to come up with a (somewhat poor, but perhaps apt) analogy, it would be like flying a plane point-to-point verses driving the back roads. As an avowed star-hopper, I'm always interested in learning new tips and tricks. After years of inverted finders, then 1x Telrads, I've found that for me, the biggest must-have is an RACI finder, as it matches up well with the PSA regarding magnitude limits. Even though I earn a living reading plans, schematics, shop drawings, etc, and can read them at any orientation...upright, backwards, over my shoulder... sometimes it's nice to have to the chart match the view in the finder, and not have to mentally rearrange the image. That makes for less 'thinking' at the eyepiece, which in turn makes the hobby more relaxing. I've recently bought a couple of 50mm RACI finders and enough recievers so that I can mount one on each of my visual scopes. 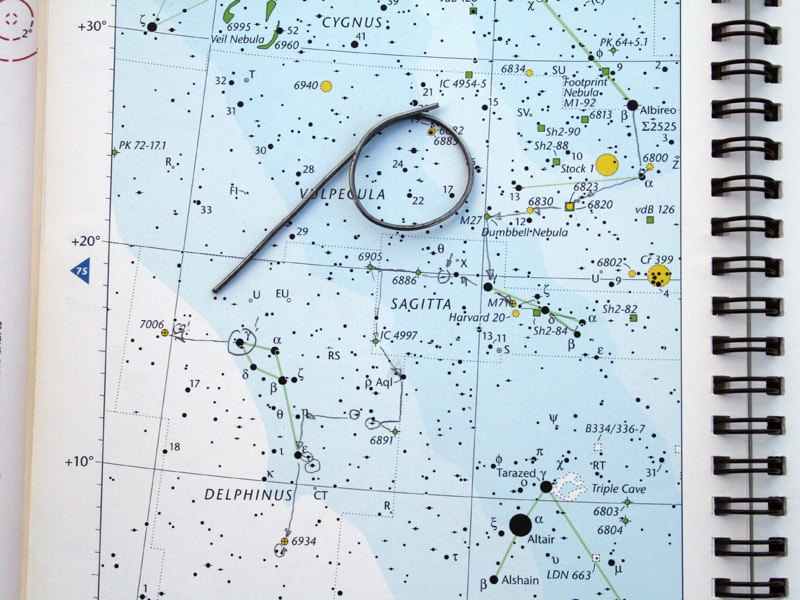 The field of view and light grasp is a great match for the Pocket Sky Atlas. Edited by jgraham, 03 October 2015 - 05:04 PM. After a long day of driving I needed to relax. 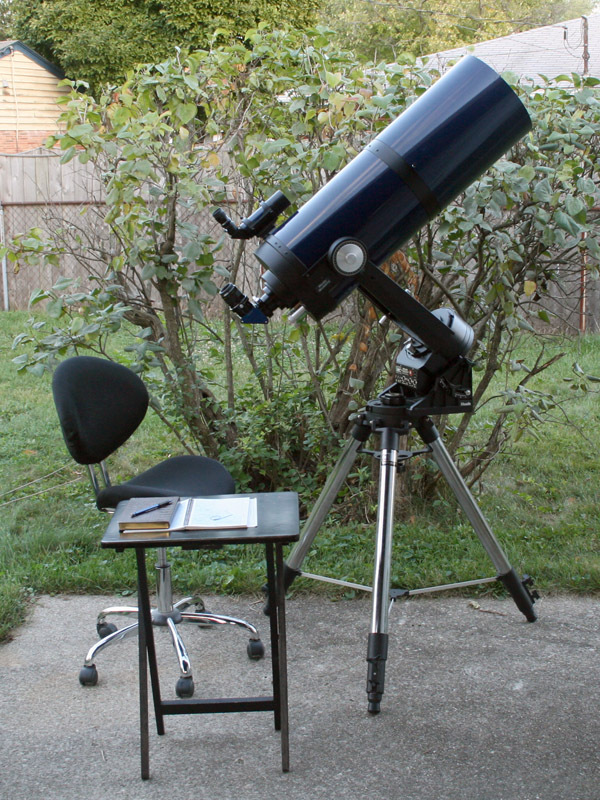 The evening sky was partly cloudy, but the openings in the clouds were fairly large, so I got out my orange-tube C8, a comfy chair, a small table, and my Pocket Sky Atlas for a walk around western Cassiopeia. What’s really neat about these walkabouts is that I get to find all sorts of double and multiple stars and small asterisms and I get a real feel for the variety of star colors. I also visit every deepsky object along my path and I often find little gems and big surprises. I’ve imaged most of the deepsky objects along this particular walk, but this was the first time I’ve seen many of them with my C8. It’s neat how thy look so different visually than with my camera. With my camera, I can make them bright and bold and easy to see. Visually, they are so delicate, soft, and quite beautiful. The two nice surprises on this walk included NGC 7789 (Caroline’s Rose) and M52. When I first settled in on Caroline’s Rose I saw a large, faint, fairly sparse cluster, but as my eyes adjusted to what I was seeing the faint glow in the background began to resolve into a rich field of beautiful faint stars. Wonderful! M52 shares the field with NGC 7635 (the Bubble Nebula) and by the time you’ve processed the image to show the Bubble, M52 has become bright, harsh, and colorless. Visually, the Bubble is invisible (so far) and M52 is small, wonderfully rich cluster. I'm looking forward to walking this path again with a larger scope. John, I enjoy seeing and reading these reports so much. Thank you for continuing to share them. Great information and examples of planned star hopping. Thanks so much to all for posting these examples and discussing the tools you use. Very helpful to us newbies.